Energy Saving Tips (EST) part 2, by Dave Lambert, Rainbow Power Company. Before we discuss fans and air con I might make a few comments about house design, insulation etc. 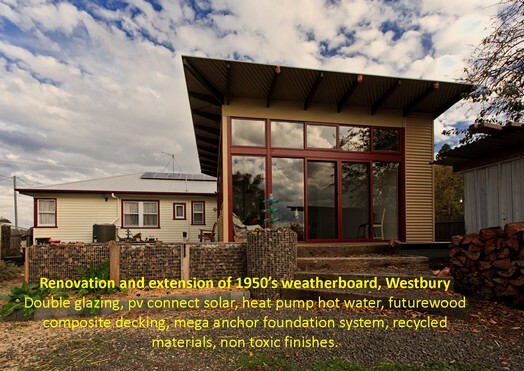 If you are building a new house you should definitely seek advice from a book or from a building designer about incorporating some passive solar principles. The key one is to design the windows & eaves to let warming sun into the building in the winter but keep it out in the summer. If you own the house, you should ensure that all the doors and windows make a good seal when closed. When I insulated my ceiling I noticed a big difference. I also had a tinting film placed on my eastern and western windows. These exclude 60-70% of the heat. You should have heavy floor to ceiling curtains on all your windows and glass doors. These are surprisingly cheap at a well know curtain store especially during their many advertised sales. With these features my house stays cool until 1-2 pm on a hot (30 – 35 C) summers day and it stays warm until about 9 pm on a cold (0 – 4 C) winters night. Having lots of windows and doors allows you to let in the cool air once the sea breeze or cooling evening temperatures eventuate. If your house is ‘boxed in’ by other houses or thick vegetation you might need a fan to either help the cool air to get in or the hot air out. Whirlybirds and exhaust fans can help get rid of the hot air in your attic. With fans in the house, close and small is beautiful. Like using a small 5 Watt desk lamp to light your desk why not use a small 15 watt desk fan to cool you rather than using a distant 40- 60 watt ceiling or pedestal fan to do the same job. On a muggy summer night I must admit that a ceiling fan above the bed on low speed (about 25 watts) is very nice. An exhaust fan over the stove not only gets rid of smoke/ smells but also heat which is welcome in the summer. Turn off fans when they are not being used. Turing off lights, TVs and computers when not being used will keep you cooler in the summer. Most ceiling fans have a small switch (usually on top of the fan) to reverse the blade direction to help direct the warm upper air downwards in the winter. Most people assume that air con is very expensive to run. 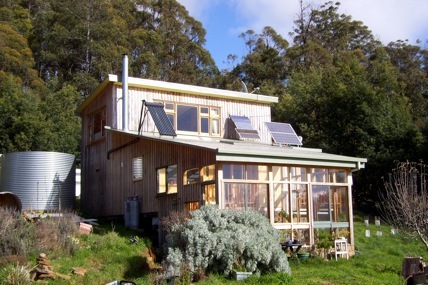 This can be true- a small house sized 6 kW output reverse cycle a/c uses about 2 kW of electricity. However, in my well sealed and insulated house I only use it for 30- 60 minutes a day on maybe 20 times in summer and 10 times in winter. To be blunt this makes the difference between living in comfort or coping with ‘somewhat unpleasant’ days. A reverse cycle a/c is the most efficient form of electric heating- 2-3 times more efficient that a bar heater. A 20-30 minute ‘blast’ from mine heats a couple rooms for a few hours before I go to bed. Split system or reverse cycle are more efficient than a box window type. They are also quieter and have the advantage of also being a very efficient heater in winter. I use one to cook a 2.1 kg chook + spuds and it uses 1.28 kWh. A bread oven bakes a yummy load of bread using about 0.40 kWh. A rice cooker cooks 900 grams of wholemeal rice for 0.515 kWh or 0.31 kWh for white rice. A 2 slice toaster uses about 0.045 kWh for 2 slices of toast. An electric frypan cooks a couple steaks using 0.300kWh. An electric jug uses 0.04 kWh to boil 350 ml of water- using a pot on the stove takes 0.11 kWh. So remember, ‘small is beautiful’ and purpose made appliances are best. When reading the above figures- remember if you are grid connected one kWh costs you about $0.30. If you are on a stand alone solar system, about 300 watts of solar panels will generate about 1 kWh / day. Many have systems designed to meet their needs in the cloudiest month of the year meaning they often have ‘power to burn’ at other times- try some solar PV powered cooking, especially if you can do it during the sunny part of the day. Using a gas stove is generally considered to be the cheapest & most environmentally sensitive method to cook- this is becoming more debatable as the the environmental and health issues become better known and gas prices are on the increase. The dirtier methods of generating power from coal are being phased out. Those on solar, be aware that many gas stoves & ovens use electricity as well (to light the elements; control oven temperature and to run an oven fan). Using a microwave oven will use about half the energy that conventional cooking uses. However, some are concerned about the health effects of this type of cooking and generally speaking food doesn’t taste as good- eg mushy rather than crispy etc. The Turbo 3000 convection oven roasts, broils, grills, bakes, and steams an assortment of food, whatever your taste. Heating water accounts for 25- 30% of the typical household’s energy use. However, using off peak power is still pretty economical because it makes use of coal generated power at night which would otherwise be ‘wasted’. This is because it takes days to shut down a large coal fired generator. However, the government is trying to reduce this usage for the future when the use of large coal generation is slowly reduced. New houses are not allowed to have an ‘old school’ type of electric hot water system. What are the options? Using gas if you have a town supply is a good option. This generates about 1/ 3 the greenhouse emissions of conventional hot water. A Heat Pump (Quantum type brand) uses between 25 and 50% of the power of a conventional hot water system. They work best in warm climates and don’t need to be in the sun or on your roof. They are about 3 times more efficient than a conventional hot water system at 15 C but 5 times at 30 C ambient. They operate on the refrigeration cycle principle- they have a lot of moving parts and make some noise which can be annoying in the suburbs. In cool climates they may need electrical back-up. A solar hot water system can produce 50 – 90% of your hot water needs depending on where you are in Oz. In the Nimbin area this is assumed to be around 80%- however, if you don’t require steaming hot water every day, it might produce more like 95% of your needs. I only boost my hot water a few days a year, however, I also tend to have plenty being a single user. The down side is that they cost around $4000 to install – my feeling is that you need to have a family water usage pattern to make them ‘cost effective’. You can determine this by looking at the cost of your ‘off peak (Controlled Load 1) on your bill. If you already have a solar hot water system I suggest you only switch on the power when you need to- otherwise you can waste power by heating the water super hot which you may not require or which can be heated later by the sun. Off peak power is supplied at night but on the weekend – surprise surprise it comes on for periods during the day- again you could be using power to needlessly heat your water. I should say that health regulations say you should always have the power connected so the water is always hot enough to kill legionnaire bacteria- if you have a healthy household, I’ll let you make that choice. There are two types of solar hot water system- the older type flat plate collector (basically some copper pipes painted black inside a glass box) and the newer evacuated tube type (usually made up up about 20 sealed tubes). The flat plate take up more room but when coupled to a stainless steel tank on the roof they are a simple and elegant piece of technology with no moving parts. You need a strong roof to take their weight. In frosty areas you need to get a slightly more expensive and less efficient sub type with a closed loop of ‘anti-freeze’. The tube type take up less space; they are more efficient in cloudy weather and can handle very heavy frost. They have a tiny circulating pump which comes on occasionally and a number of sensors which may in time need servicing. The tubes can be individually and easily replaced if any get broken. (household insurance should cover you for hail damage). There are two types of tank- stainless steel which as best in areas like Nimbin with good water. The other type is an enamel finish with a sacrificial anode that needs replacement every few years to prevent corrosion. It is a complicated choice which one to get- I definitely suggest you shop around and ensure that the seller of the system will be responsible for its installation- that way one can’t blame the other if something goes wrong. I would also caution that installation is quite tricky and while good plumbers are expensive it is probably not a job for the home handyman. – when I have my morning walk I notice one shop with an old vid/ TV going in the window 24/7; another shop runs their ceiling fan all night (this warms the room- fans only cool by evaporating moisture on your skin & dissipating your body heat). You can buy 240 volt timers for $10- $20; 12 & 24 volt ones are also available. PIR or motion detector lights save a lot of power as they only come on when needed. Energy Saving Tips (EST) part 1, by Dave Lambert, Rainbow Power Company. 200W x 5 hours or 100W x 10 hr all = 1 kWh ( $0.29 on your power bill). Urban myths: a) “My art deco 20 yr old beer fridge with 125mm thick walls, manual defrost and exposed condensor coils is effecient”- WRONG! a new auto defrost fridge with thin walls etc would use about 1/3 the power! b) “Upright fridges are very ineffecient because all the cold air drops out when you open the door”- according to a USA uni study, door opening accounts for about 7 to 11% of the power consumption. Cooling air does not take that much energy. This can be minimized by keeping your fridge full & buying a fridge with some closed drawers/ compartments (my Electrolux has a conventional vegie crisper, but also a small goods drawer, egg & butter compartments. c) “Having the freezer on the bottom would be more energy effecient” No true, at least for the Electrolux range. One large fridge is more effecient than having a seperate fridge & freezer (or a beer fridge- sorry guys). A large fridge uses more power than a smaller one but only a bit more- on similiar models, power used is proportional to the surface area of the fridge. eg the 420 litre Electrolux uses 318 kWh/ year while the 520 litre uses 356 kWh/ yr. If you do have an old clunker with manual defrost- keep it de-iced as much as possible- eg defrosting once every few weeks if needed. Replace the door seal if it is compressed or perished- It should hold a sheet of paper when closed. If you live on solar, place any warm food or drinks in it on a sunny morning if possible. If you buy a new fridge- look at the Star Label- it will list kWh per year- divide by 365 to get daily power- in fact they tend to use less than the suggested amount in a ‘normal’ domestic situation- if interested- RPC has monitored two fridges for a full year: http://www.rpc.com.au/products/appliances/fridges/fridges.html and click on 420 litre Electrolux TAB. Why do I keep mentioning Electrolux? Well they are the most effecient and made in Australia! First we need to learn about phantom loads. This is power usage while the device is on some form of ‘standby’ or even when supposedly turned off. This power usage can add up to as much as 10% of your power usage, however thanks to public & gov’t pressure this power waste is being lessened on new appliances. This power is often used to keep a clock going, LED indicators lit up and the appliance able to be turned on by a remote. Unless you need the clock function to record a program or bake a loaf of bread when you are not home, I suggest you switch off devices ‘at the wall’ or powerpoint. Get yourself a ‘power board’ with a single switch to turn off all your TV or computer peripherals at once. This will not only save power but in most cases it will prevent damage from power surges & brownouts (from lightning and other faults). There are several types of TV on the market- the olderpower hungry box type CRT; larger Plasma and LCD. The newest LED/LCD type are the most energy effecient. New ones all have a Star Label indicating how many kWh/ year they would use if turned on 10 hours a day and left on Standby the rest of the time. Divide by 365 and then by 10 to get average usage per hour (while running but otherwise on standby). This figure is likely to be less than the wattage listed in the manual or on the compliance label which is a maximum continuous figure. Don’t buy a TV larger than you comfortably need for your room size- eg 40″ is recommended if you will be seated 3 metres away. Large TV’s generate a lot of heat which can be a bonus in winter but a real bummer in summer! You can save a lot of power if you are prepared to watch a small one on your desk! You can save up to 30% of the power by turning down the brightness setting on your TV- do this during the day and reduce it untill you still have a good picture. The default setting tends to be very bright so they still look good in a very well lit show room. It will also be easier on your eyes! Most TVs currently on sale only use one watt or less on standby. Older ones could use several watts or more. Peripherals like a DVD, 5:1 surround sound, PVR and Austar decoder all have phantom loads- Austar is outrageous and uses about 20 watts whether it is on (fair enough) or on standby! I plug all mine into the one power board & switch the lot off at once. Austar take about 1.5 minutes to ‘fire up’ (MyStar recordings & settings are kept when switched off). If you are on solar, phantom standby loads will use even more power as it will keep your inverter on run mode and at the lower end of its effeciency range. Lets start with a bit of simple definition- a Lumen is a measure of the ‘quantity’ of light to say light up a room; while Lux is a measure of the intensity of light on a surface. Lux increases as you bring the light closer to the measuring device. The efficiency of a light is best expressed as lumens per watt. Now days there are three main types of lighting on the market- halogen, fluoro and LED. Fluoros and LEDs now have similiar efficiency. Halogens are only about 30% as efficient as fluoros & LEDs. Halogens were ‘all the rage’ a decade ago and were installed in many ceilings. They are power hungry and generate a lot of heat. Their main advantage is that they give a warm natural colour rendition and are favoured by artists and expensive clothing and jewelry shops. They are available as 12 or 24 volts and must run from a transformer for 240 volt households. LEDs give a very focused or directed light and are ideal to light up a desk, kitchen bench or hallway. They are less than ideal in lighting up a whole room. They do not have a filament to easily break so they tend to last a long time and make ideal torches because they are robust and give a naturally focused light. They are generally around 5 watts. Unlike fluros, they do not emit electromagnetic fields. The new generation of LEDs give a good light and are available in cool and warm colours. Fluoros can either be staight as found in many old offices and school rooms or as compact fluoros (CFLs). Both types have similiar efficiency and are available in warm or cool/ daylight colours. The CFLs distribute most of their light sideways, so a conical white shade is important to direct their light downwards. CFLs are generally between 3 and 20 watts and they are about 3 times more efficient than the old incandescent bulbs (which you can no longer buy). Dimmers can only be used with specially designed lights and may not save much power. You are better off to have several lights and turn them on/ off as needed. If you are leaving the room for more than 10 minutes, turn the light off. Bring the light as close to you as possible. If you have light on a high ceiling, drop it down closer to head height. A desk light will only need a few watts to be effective but you would need 15- 50 watts to light up a desk from a ceiling light. Light coloured walls will reflect the light better. The light output of all lights degrade with usage- this can be significant- eg 20% after a few years. It may be worthwhile to replace them every 3-4 years if you wish to obtain maximum light effeciency. There are two main types of computers- laptops & desktops. I class anything that works on internal batteries as a laptop. The average laptop uses around 30 watts while a desktop uses around 180 watts. In general terms any gadget that has an internal battery has been designed to be energy efficient, otherwise the battery would start weighing kilos. (Don’t be worried by the laptop power supply being rated at 200 watts or the desktop at 500 watts- these maximum figures will only be reached for perhaps seconds). If you have a desktop, the most energy efficient monitor is the newest LED/LCD type, followed by LCD and then the old box CRT types (not many around any more). The peripherals can add up- external speakers, external hard drive, modem, printer etc. The big tip again is to have them all on one power board and switch the lot off in one go when you are not using the computer. How often should you switch it on / off is a good question and is the subject of some debate. Most computers have some built in power save functions. In XP go to START, CONTROL PANEL and then select POWER OPTION. It is suggested you use this software to turn off the monitor after 20 minutes and the hard drive after 2 hours of non use. This ‘covers you’ if the phone rings, the baby starts crying etc. If you don’t have XP you probably know more about computers than me! If you are definitely not going to use your computer for more than say an hour, I would switch it off at the power board. Urban myths include the computer will use heaps of power to start up and switching it on/ off it causes wear & tear. The computer is likely to become obsolete before failing due to switching it off & on. Generally speaking, printers don’t use much power except when they are actually printing. This time is not likely to be very long in a home situation. Again- switch everything off at the power point/ wall or power board when not in use! First let me tell you about my favourite web site as a power system designer. It has power and other information for TVs, fridges, dryers, washing machines etc. which have a Star Label. You can first search by brand, size, type etc. It then lists all the relevant appliances. You can order the list by size, power usage etc. If you click on comprehensive detail it gives you even more info. Some appliances like washing machines are very tricky to estimate their power. If you look at the compliance label it may read 2000 watts which includes an electric heater to heat the water! When it operates it uses many different wattages depending whether it is agitating, spinning, pumping etc. So how do you tell how much power it uses to do a load of washing? Unfortunately the Star Label is tricky for this appliance because it assumes you are using electricty to heat the water- so washing machines that use a lot of water show that they are rather power hungry. Fortunately, the web site is now starting to show power used for a standard cold wash. The other way to determine what your machine uses is to get your own very plug in watt hour meter. http://www.rpc.com.au/catalog/economy-power-meter-p-2470.html This will tell you how much power you use to do a load of washing; how much to bake a loaf of bread; how much those computer gadgets are using etc. Maybe there is a chance you can involve the rest of the household to become interested in electricity and becoming a power miser greenee! OK- lets get onto the topic. The good news is that modern washing machines are surprising energy efficient providing you supply your own hot water or do a cold wash. On average they use about 150 Wh per load. If you are buying a new machine make certain you can do a cold wash and that it has a hot and cold water connections. If possible do one large load rather than several small ones- difficult to do I guess if you have some smelly nappies! Use a cold wash or solar generated hot water. Front loaders tend to use less water but more power! Fischer & Paykel (top loaders) are recommended for those on solar because they will run on a smallish inverter- eg say 800 watts. Pick a sunny morning if possible to do your laundry. Modern washing machines have sophisticated electronics that can be fried by running them on gen sets. Use a Hills Hoist or clothes line to dry your clothing- a clothes dryer uses around 4 kWh (4000 Wh) to dry a 5 kg load- about $1.20 worth of electricity per load- that adds up over a year!. Have an alternative line on the verandah or under the house for those rainy days. This website contains various details including energy efficiency and star ratings for a range of electrical appliances that carry an energy label. It also lists products residential, commercial and industrial which have been registered for minimum energy performance standards (MEPS).